Frederick du Cane Godman, and by descent. J.Gould, The Birds of Asia, London, 1840-1848, vol. VII, pl. 66. In 1841 the sudden death of his wife Elizabeth left Gould without an illustrator to complete his monumental Birds of Asia (1840-1848). He was fortunate to find in the young Henry Constantine Richter a worthy replacement. Richter contributed more than 1,600 illustrations to Gould's books and articles including, Birds of Great Britain and Birds of Asia. In 1841 the sudden death of his wife Elizabeth left Gould without an illustrator to complete his monumental Birds of Asia (1840-1848). He was fortunate to find in the young Henry Constantine Richter a worthy replacement. 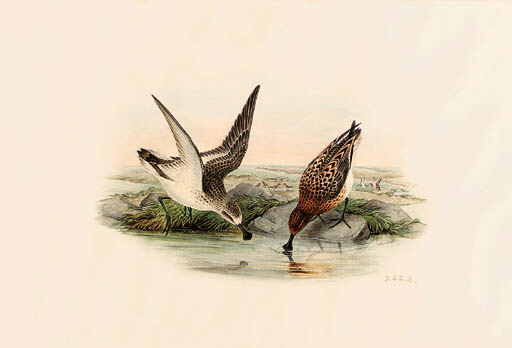 Richter contributed more than 1,600 illustrations to Gould's books and articles including: Birds of Great Britain and Birds of Asia.